Sprained Ankle Symptoms: What Are They? - Jeffrey H. Berg, M.D. Although ankle sprains are much more common than breaks of the ankle, sprained ankle symptoms are often confused with those of an ankle fracture. 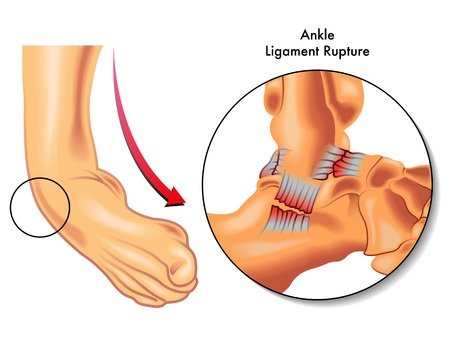 As you may recall from an earlier post, ankle sprains are extremely common. In fact, they are perhaps the most common bone and muscle injury of all. They can occur from nearly any activity but frequently develop during athletics. The most common type (lateral sprain) occurs when the foot turns over (inversion) so that the back of the foot is turned toward the ground. Other types include the medial or deltoid ligament sprain that occurs when the foot twists in the opposite direction (eversion) and the high ankle sprain which occurs with outside rotation (external rotation) of the foot. Since sprained ankle symptoms are so common and so often confused, let’s take a look at the frequent symptoms for the most common ankle sprain, the lateral ankle sprain. 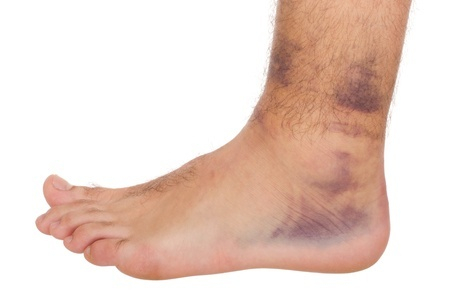 The symptoms of a sprained ankle usually progressively resolve between 2-6 weeks after the injury. The delayed sprained ankle symptoms differ from the earlier symptoms and slowly improve over time as well. Most sprained ankle symptoms typically resolve with time. The weakness, instability and some pain from fatigue or recurrent minor or more significant injuries can persist or recur. Physical therapy can help prevent this or reduce the recurrence frequency. The common sprained ankle symptoms often are confused with those following a break of the ankle bones. It can often be difficult to distinguish between the two without a professional exam and a X-ray. If you have injured your ankle and you have some of the above symptoms, it is probably a good idea to have your ankle assessed by your Orthopaedic sports medicine doc.